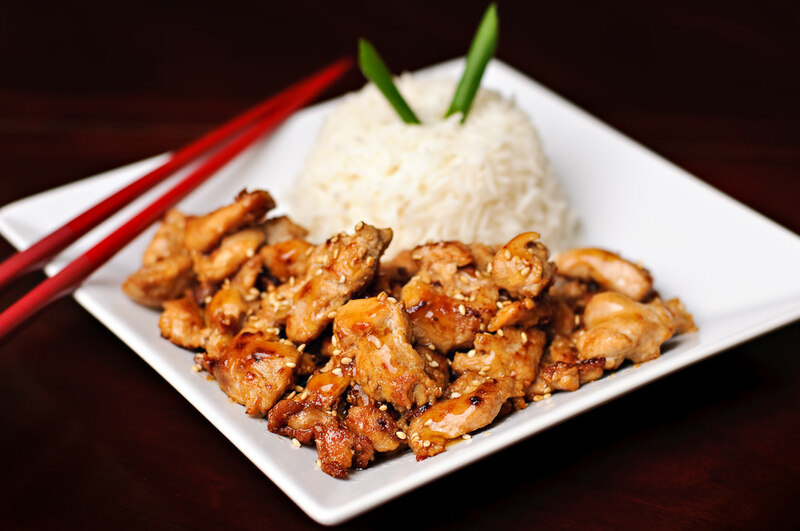 If you love Chicken Teriyaki, this recipe will not leave you indifferent. I was not much of a Teriyaki person for a long time myself, but I had to reconsider my preferences once Omar started liking it. 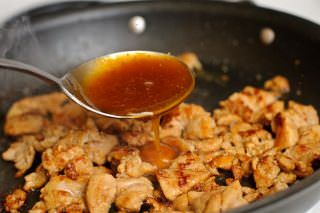 Being a cook-from-scratch lady, I looked for the perfectly tender, delicious Chicken Teriyaki recipe for almost 2 years. After many trials and errors, mixing multiple recipes, the perfect Teriyaki Chicken was born! You need to know what your Chicken Teriyaki consists of! Oh well, it is not such a descriptive list, is it? But you get the idea. I confess! It is not the world’s easiest recipe! You need to have some time on your hands to fix it up. 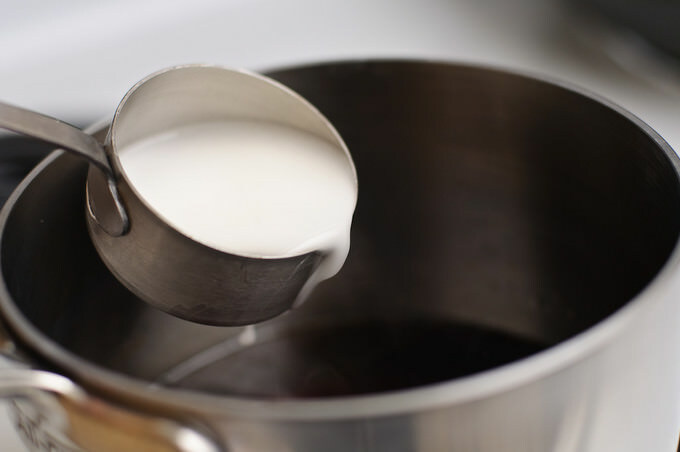 You cannot whip it up in 5 minutes. Not even in 5 hours! Thus, I make it only on the weekends. That’s when my husband can play “Need for Speed” with our little punks, leaving the premises of the kitchen to its Queen. Yeah, that’s me, alright! The marinade should stay in the refrigerator overnight! So, plan everything accordingly. Do not freak out :) It is much easier than it actually looks. Does anyone like Sakkio, Sarku or Sakura Japan’s Teriyaki? This is the closest you can get! Enough talking, shall we get to work? It is not going to be your average, store bought Teriyaki sauce! Please do not opt for anything different. It is 60% stock based and you can make it at home, from scratch, like I do. 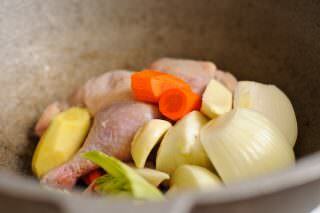 If you do not have time, or do not want to deal with it, use pure, unsalted chicken broth instead. Cut the chicken in bite-size pieces together with the fat. 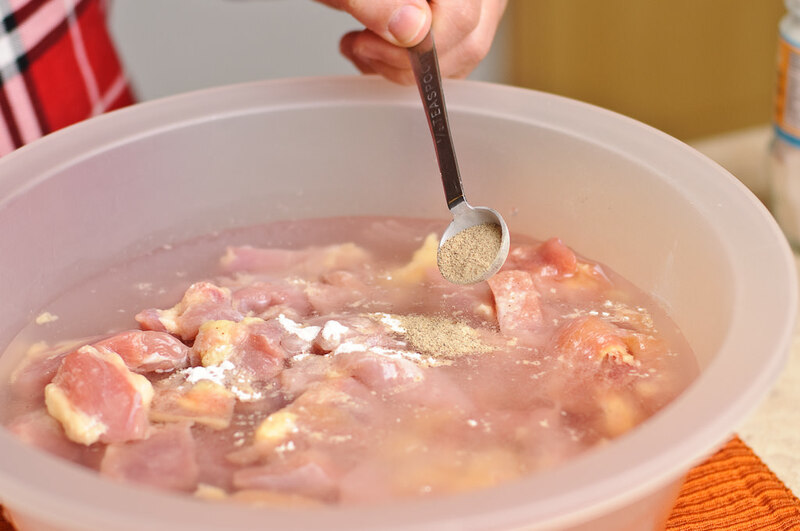 Place the chicken in a large container. 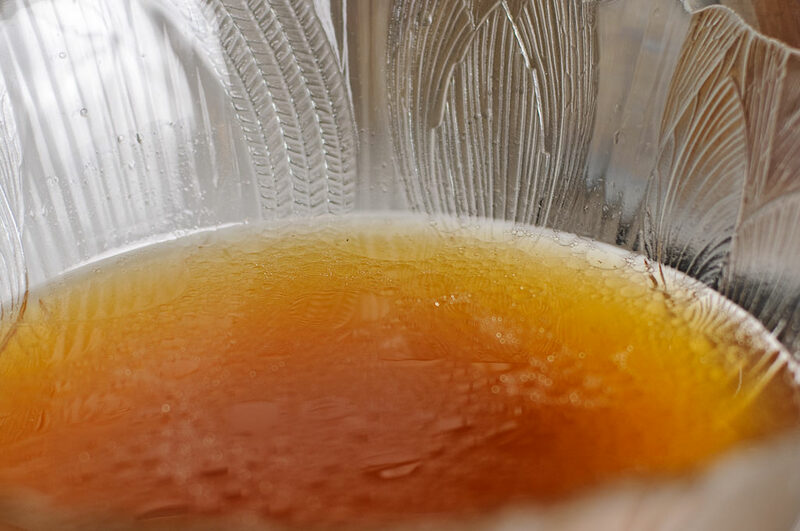 Mix the Sherry-Wine-substitute-ingredients, if you are using one. Add water to the container with chicken, add Sherry Wine (or substitute). Add garlic powder, white pepper, oil and Soy sauce. 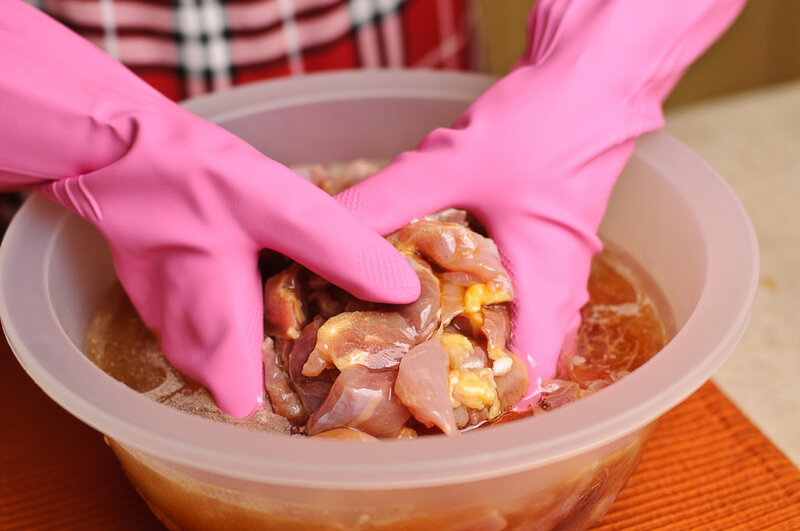 Put on a pair of gloves, mix all of the ingredients and start massaging the heck out of the chicken pieces. It usually takes me about 15-20 minutes. 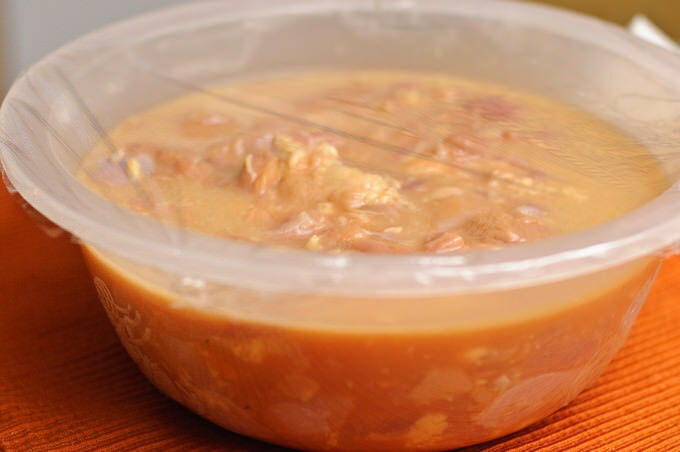 Once you are done, cover the container and place it in the refrigerator OVERNIGHT! 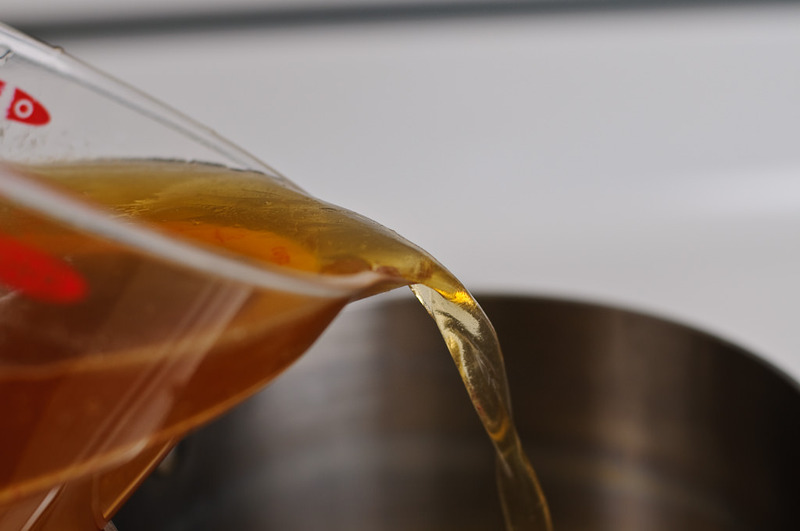 If you are using store-bought chicken broth, measure 2 cups of it, in a small saucepan bring it to boil, add a couple of very small slices of ginger root, tiny bit of minced garlic and cook for about 30 minutes. Fish out the ingredients, creating a nice golden broth. In the morning, separate the stock from the remaining ingredients. Discard the vegetables and all, leaving the stock. 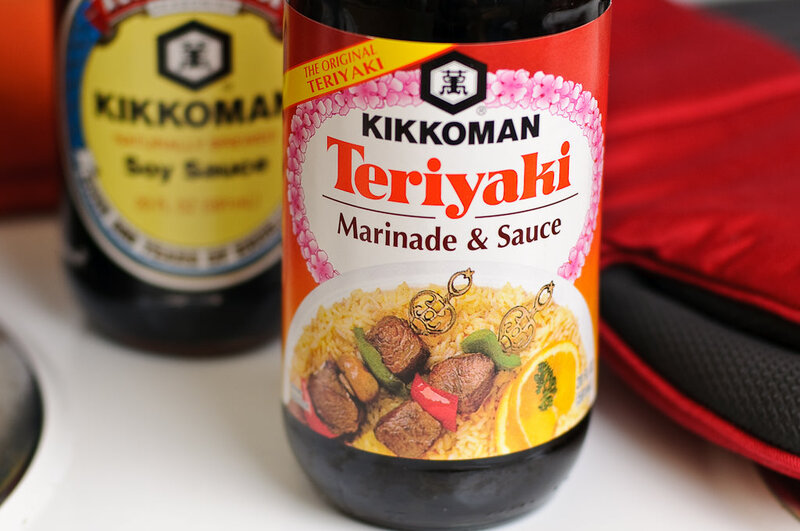 You should have this amazing smelling soup (even if you are using the ready chicken broth), which is going to get mixed with these amazing Kikkoman sauces. Measure out 2 cups of broth in a saucepan and bring it to slight a boil. 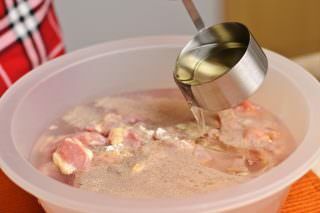 Meanwhile, mix the starch in 1/5 cup of cold water and keep it aside until needed. Add Teriyaki and Soy sauces, sugar (sorry, not picture of the brown sugar) into the slightly boiling broth, mix everything well and turn the heat down to medium-low. The starch is added to the chicken to give it a saucy look. That’s how Japanese and Chinese get the consistency of the sauces they use for different dishes. Without starch our sauce is going to be watery and not much flattering. Add the starch mixture (give it a stir one more time before you add it). 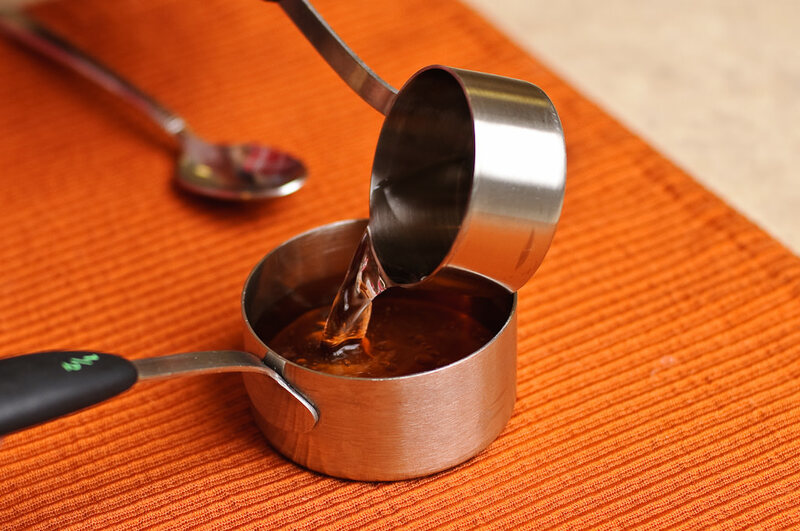 Mix the sauce very, very, very well to prevent any type of lumps! 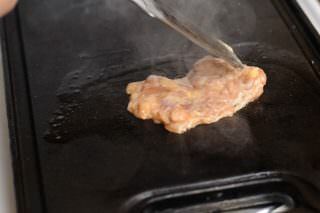 Give it thirty seconds or so to accept the starch and thicken up. 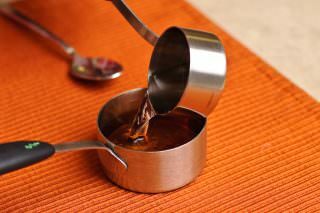 Your sauce should ONLY be thick enough to leave a glaze on the spoon, or stick to the side of the pot if you splash a little bit of it – no thicker. Behold, you have a small piece of heaven in your kitchen!!! Remove the sauce from the heat and start working on the chicken. 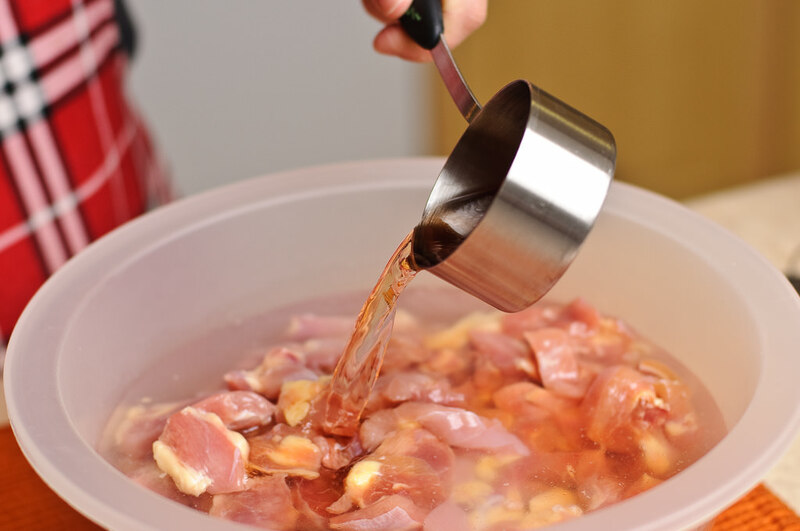 Take out the chicken marinade from the refrigerator. This is the not the so much fun part! Oh, was it much fun all along though? 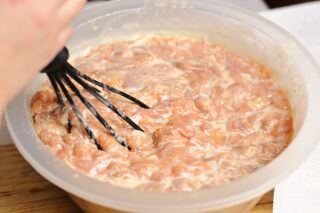 :) But if you really like a challenge (please, do like a challenge) start mixing the chicken with the whisk. I do so by hand, since I do not have a standing mixer. But if you are lucky enough and have a mixer with a dough hook, let it do the work for you. 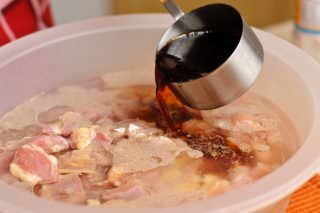 The chicken/marinade mix needs to run at least for 30 minutes. You will know it is done because all of the fat will be separated to look almost like a fatty white snow. This step cannot me omitted! To have the perfect chicken, it has to be done this way, trust me! Both cooking methods are good and the procedure is the same for both. Turn the heat up to maximum, spread just a little bit of oil on the surface, dump the portion of the chicken and let it cook 5 minutes on each side. Do not disturb the chicken while it is cooking. 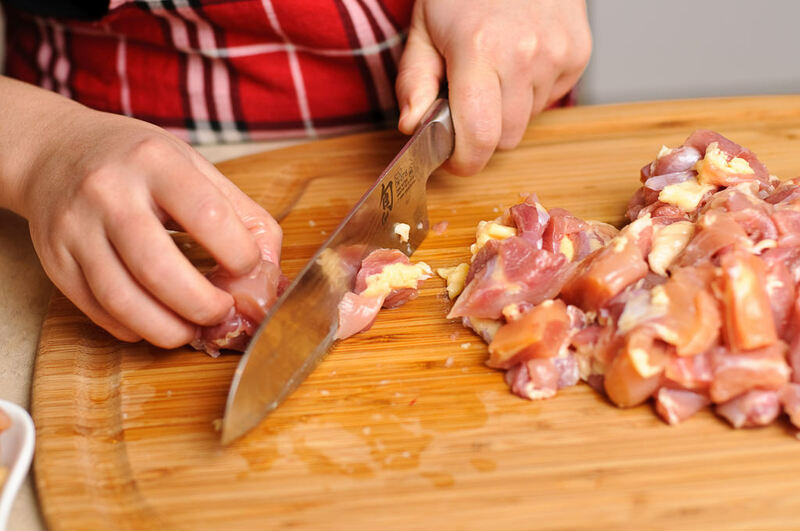 Once 10 minutes are up, slice the chicken with your spatula in bite size pieces. 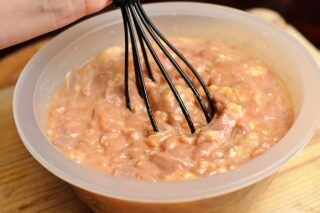 Pour some of the sauce over it, toss the chicken with the sauce once or twice…aaaaaaaand you are done!!! Serve the chicken with rice and steamed vegetables. Pour some of the sauce on top of the chicken once you start serving. Believe me, this chicken is sooo good that the taste will stay in your mouth for a long time! Our whole family loves this Teriyaki Chicken and I’m sure yours will too! Irosh, it is actually not that complicated at all. I try to explain everything in smallest details, so that there are no problems later. This by far my longest recipe. Read it and visualize. What I do is, I marinate the chicken and put out the soup on the stove top at the same time. In the morning both of them are ready. You are a super multitasker! You can do it!!!! 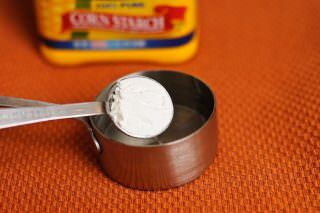 I need some clarification: ◦1,5 Tbsp corn starch – is this 1/5 or 1 to 5 tbsp? Another one: ◦Coupe of pices of cabbage – :-) – 6 cups or anything else? KL, lol. It was pretty darn late when I was writing this. But thank you for asking me. It is 1 and a half Tbsp of corn starch. As for the cabbage, I literally use couple of pieces. How about like 2 oz? 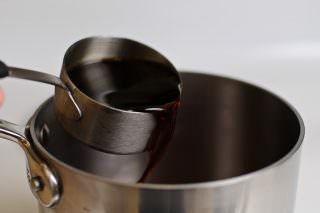 One more thing about the corn starch, you do not want to use more than 2 Tbsp on any sauce or gravy you want to thicken. It will be too jelled otherwise. I think she meant 1 and 1/2 tbsp corn starch and few chopped green cabbage leaves. Yengi rasm va receptlardan ispire qilish uchun deyarli har kuni blogizga kirib turaman. Ishlarizga omad, yangi receptlar kutib qolaman! But I know once I try to make it a couple of times then it gets easier than it actually looks. Awesome job, LolaM:) Chicken looks so yum! Im sure my husband will love this if i make it for him!! 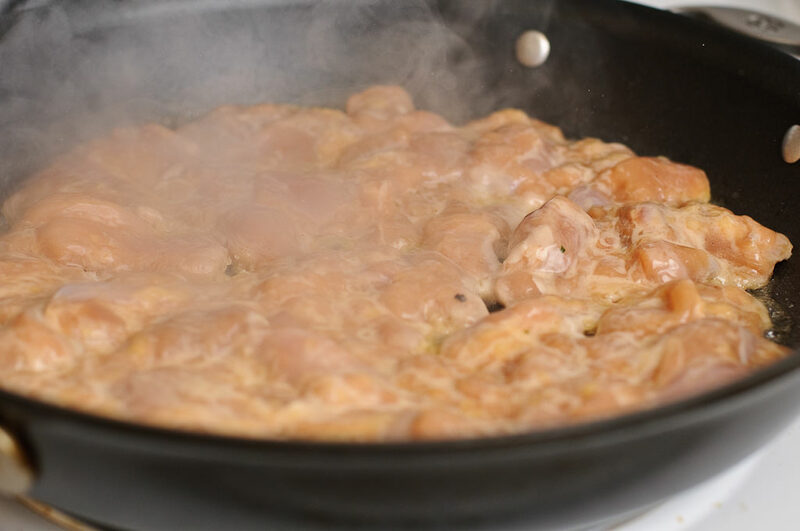 Just a quick question : I am a vegetarian, so while I make this wit chicken for my husband, can you suggest something for me to substitute chicken with? Thank you for dropping by my blog :) I am sure your husband will love it! The sauce is very rich and tasty. Believe me, you will have a lot of it :) It goes well with multiple combination of things. You can substitute the chicken with virtually any protein or meat substitute. Seitan (Wheat gluten) and tofu would be ideal. 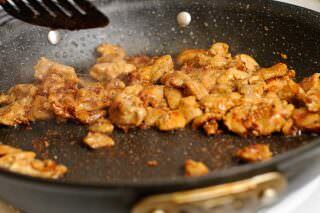 While I do not recommend marinating the tofu, Seitan can be marinated like you marinate the chicken. It is not going to take up the whole night of marination though. 20 minutes or so is more than enough. Stir fry it with a little oil and pour the sauce. If you are getting tofu, get it extra firm. 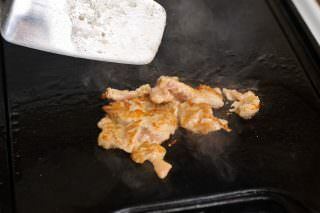 Coat the tofu with egg substitute, sprinkle with a little corn starch and fry it on medium high heat on both sides. The tofu is going to have some nice crispiness to it. Pour the sauce on top of it, as you would do on the chicken. You can also prepare steamed vegetables additional to the seitan or tofu. It is one of the best things that can go with this sauce. If you have a steamer, steam up (for 10 minutes) pieces of cabbage, thinly sliced carrots, broccoli, baby corn, bean sprouts. Serve with scallions and pour the sauce on top of everything. If rice will sound boring to you, swap it to Udon noodles or Lo-mein noodles. You can buy them in the grocery stores nowadays. I am not sure if you eat shrimp. Some vegetarians do eat a little bit of seafood. If you do, go for shrimp! No need to marinate it. 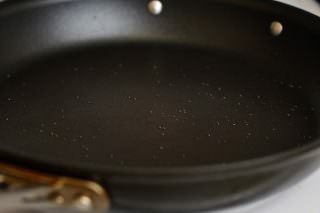 Heat the skillet, drop the shrimp, pour over the sauce and in medium heat cook with the lid closed for couple of minutes. I hope my suggestions will help you on deciding which substitute to choose :) Please let me know if you have any questions. Wow. This is one intense recipe…so intense, that I’m very tempted to try it. I’m bookmarking this recipe. Thank you so much for all the work you put into these posts. I really appreciate it. 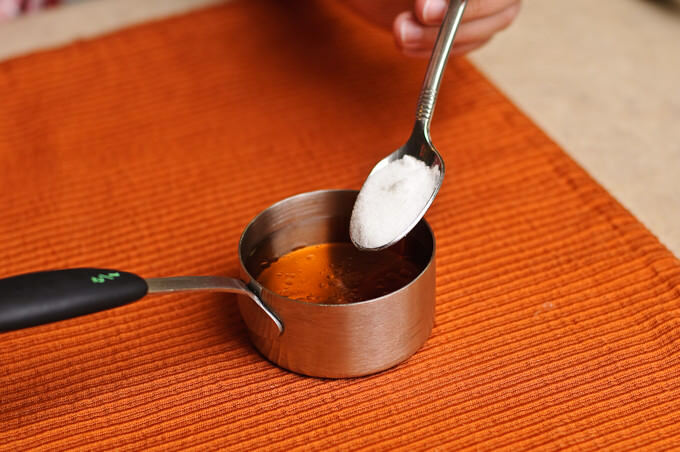 I am sure you can rock this recipe :) I am dying to find out how it turns out in your kitchen! Please let me know! 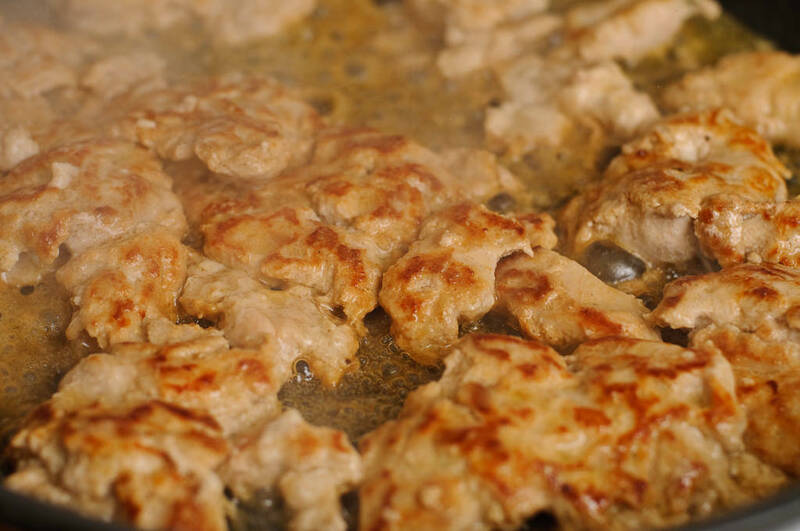 Holy cow….I don’t think I have ever countered any teriyaki’s recipe that involves so much work!!! With that saying, I am pretty darn sure this is one GREAT recipe to have on hand. I will probably be brave one of these days and tackle this project, really! With so much work putting into this, I’m sure there’s a reason it! 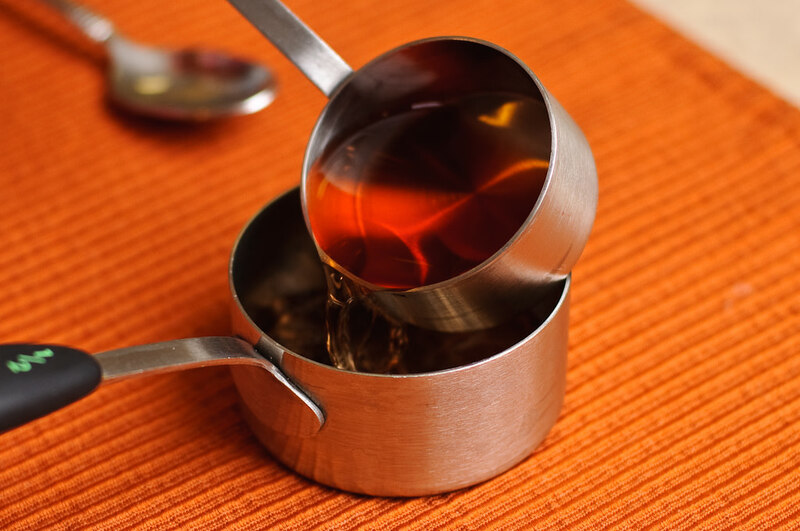 I know I shouldn’t question…but you actually simmer the broth “overnight”?! wow….. Okie, okie, okie….I heard you….! Thanks for sharing and for posting! Truly I know you put a lot of time into writing this post for us! Delicious! My boyfriend and I started making it last night and had it for lunch today. It was a lot of work but well worth it. The chicken was amazingly tender and had great flavor even without the sauce. OOOO, Congratulations on mastering this recipe! :) It certainly does involve a lot of work but isn’t it really worth it? :) It is 12:11AM down in Denver and am so craving for this Chicken Teriyaki that I can’t explain! I am glad you liked it! You can marinate the beef the same way, add mushrooms to the saute, steam the vegetables and enjoy! Yuumm!!! 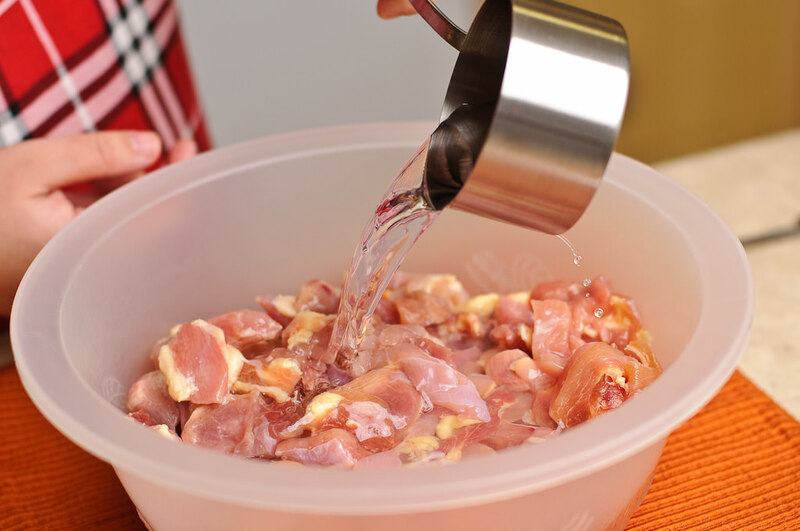 i dont think that massaging the chicken is necessary cause marinading them for 24 hours will keep them moist tender and the sauce will absorb well. I cooked this last week and we all enjoyed it. My daughter who is super picky even liked it. She loves the Chicken Teriyaki at the restaurants but she liked this one, too. I steamed some vegetables and pour some of the teriyaki sauce over it. I didn’t have time to massage the chicken but it still turned out juicy and tender. I’ll make it again but this time I’ll add a little crushed red pepper since my family is a little on the spicy side. Thank you for the recipe! I am very glad your family liked it :) You can always buy sirarcha and add as an extra to an already ready dish. I love that, too. Just wanna ask how long do you simmer the stock? Does it literally mean overnight? Or can I simmer it like for 3 hours or more? Looking forward to this recipe. I really love teriyaki. Thanks for what appears to be an excellent recipe. I like cooking and have been successfully cooking Asian and Indian meals for a while BUT for I have been completely inept at creating a sweet teriyaki chicken like the ones at Sakura Japan or Sarku. I’ve tried so many bottled teriyaki sauces and half the time I can’t even decide between a glaze or a marinade (altough I think the glaze is usually sweeter) but the end result is not what I expected. Your recipe looks like it would taste just like the mall stores (funny to be actually trying to make something taste like a mall fast food place) which are sooo yummy that even my 7 year old loves it. I could eat at Sakura all week! 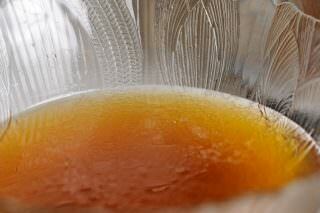 I wonder if Mirin can substitute the sherry? Made this tonight it was Excellent Family Loved it! Pour some of the sauce over it, toss the chicken with the sauce once or twice… Is this the same sauce that it was setting in over night, or do I need to make a new batch and use that instead. I been looking for a good recipe and have everything i need except chicken , but thinking this would be good with pork also. if you ever have a good recipe for lo-mein noodles Chinese let me know. and thanks for the step by step instrustions. Hello I have a question, if I’m using store bought stock/broth…do I have to let that simmer overnight just like the one from scratch? And also do I have to include the onions, carrots and cabbage with the store bought version. Thanks! My chicken is currently marinating overnight I’m excited to see how it comes out! I wonder if I can find an asian stock and use that?? Question. . so will this recipe not turn out as well if i use chicken breast instead of the chicken thighs? 1. 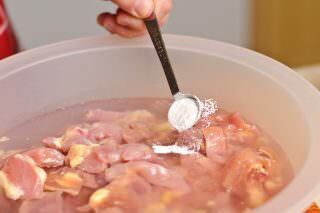 You can add 1/4 teaspoon of baking soda per 4 lbs of chicken during the mixing process, as a tenderizer. 2. Use Japanese short grain rice, and when preparing the rice, you can add 1/4 teaspoon of sesame oil per one cup of rice for added flavor. 3. Using a whole chicken carcass for the broth makes it easy to find a use for it after the previous days’ meal, like one of those common rotisserie store bought cooked chickens. There are a number of YouTube videos detailing chicken stock creation. 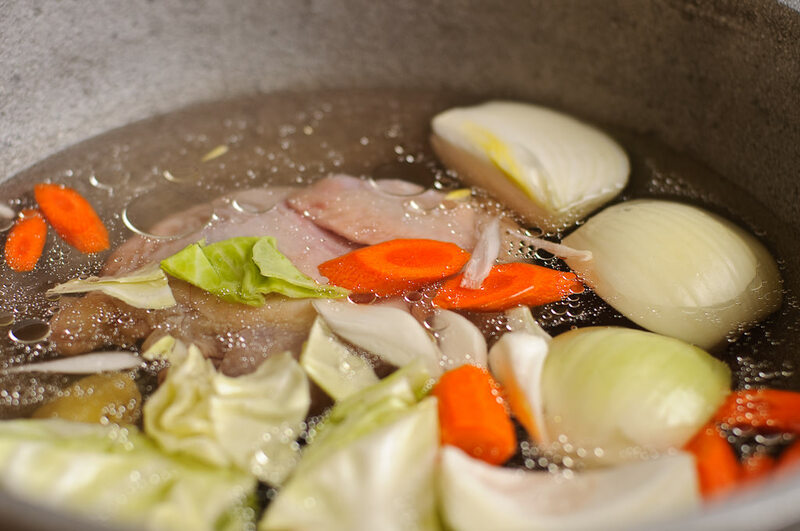 Cook the broth for at least four hours, and ideally, for about eight hours. Time consuming but really good. It smelled like Sarku when I was cooking the chicken and my family kept asking when it will be done. Just like at Sarku having to wait and drool over your order being cooked haha. Do you use garlic butter to grill it? I see they use it in the mall. Found your recipe through pinterest and foodgawker. We lived in Seattle for years and teriyaki chicken is one of the things I miss most (besides all that is the Pacific Northwest and its grandeur)! AMAZING!!!!! We tried it and it was soooooo good!!! A must try!!! Hey There! I am so excited to try this recipe! My husband and I have bee nin love with Sakkio since we met and we currently moved away from our hometown due to his job and our new area we live in does not have a Sakkio, so this recipe is going to make us feel like were home again! Just a couple questions… 1) my husband cannot stand dark meat, is there a white chicken meat that I can use that will be similar or do I need to be stealthy and sneak the dark?– easier said than done, he went to cooking school haha 2) for the Teriyaki Sauce part where I add the Kikkoman Teriyaki Sauce you typed 1/2 but didnt say half of what measurement.. so I wasnt sure if it was jar, cup or what it is was if you can just clarify those for me so I can add these ingredients to my grocery list I would really appreciate it!!! Thanks! How much marinaded sauce do you use? 1/2 cup? It does not say. It just has 1/2. Measurement. 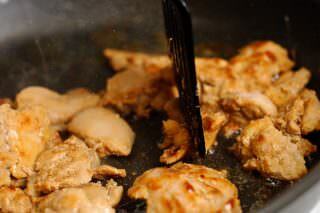 I followed this recipe to a “t” and the consistancy of the chicken meranide so SOOO wrong!!! and everyone was complaining about the broth and the chicken isn’t even chicken anymore! just strings of meat!!!! and if you plan to try thia recipe be prepared to spend at least 3 hours in the kitchen, not including the marenide and simmering. I’m very dissapointed with this recipe. I got a question that I’m hoping I didn’t overlook in the comments. After the chicken has been mixed with a stand mixer to separate the fat from the chicken, do you fry/grill up that mixture as is, or separate it? Thanks for your time. For the teriyaki sauce recipe, is that supposed to be 1/2 ‘cup’ of Kikkoman teriyaki sauce? I’ve been to many restaurants and their teriyaki chicken taste plain. It’s cooked chicken with some teriyaki sauce on top. Out of all the recipes on the internet, nothing comes close to the Sakura Japan teriyaki chicken taste until now. This is it! Thank you very much! You saved me a lot more trial and error runs. It looks like you got this recipe from cheftalk.com from Keitaro427’s directions. You really should credit this deliciousness to him! Wow! I don’t know if I’m ever going to make this, but it looks so good!! Awesome job! The food looks very delish but recipe does seems very complicated however after reading it 6 times (I’m determined to understand it..LOL) it became easier to understand. thank you for the recipe. i will be making this soon. Can I make this with chicken breast? 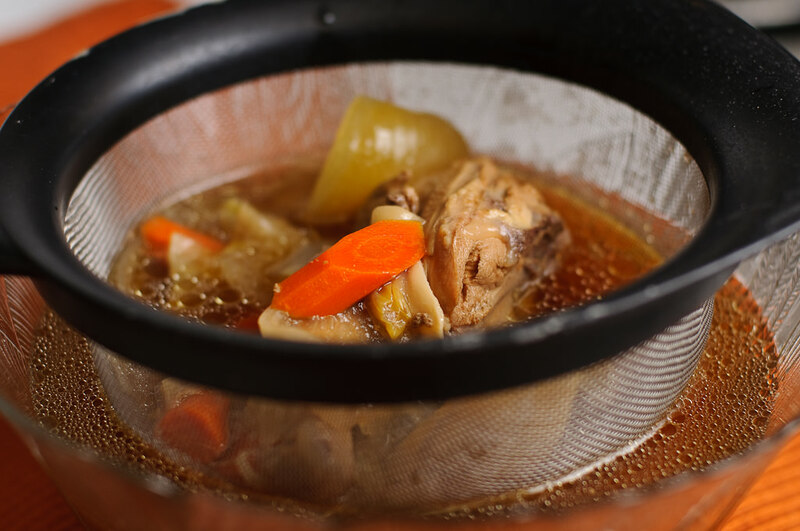 Is the store bought chicken stock also left to cook overnight? Or does it just take 30 minutes and that’s it? I WANT TO KNOW IF I CAN JUST ADD EVERYTHING TOGETHER AND PUT IT IN THE REFRIGERATOR IF NOT CAN I JUST REPAIR BOTH AND PUT IT IN THE REFRIGERATOR. Would it be okay if I let it marinade for 48 hours? I was supposed to make the meal tonight but something came up and I can’t cook tonight. Would it be okay to cook it tomorrow night, even though i made it last night? I’AM GOING TO TRY YOUR RECIPES! This recipe is/was FANTASTIC!!! My son came over couple days ago for an extended visit . When the subject of dinner came up I showed him this recipe.it had been my intention to take a shot at it and had already picked up all the needed ingredients.. 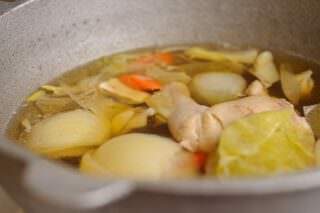 Most of the prep work was done on Monday allowing the broth to simmer and chicken to marinade over night.. We just finished dinner and I was amazed.. Being a big fan of Sarku Japan at the local lmall led me to look for this and it’s dead on the money good. Fixed ours with Thai noodles. I’ve got the chicken thighs thawing, and after a year of having this recipe pinned, I’m going to brave it. Sarku Japan is the ONLY food my kids all dig at the mall. Even my “vegetarian” six-year-old will eat it. Question, is fresh ginger a deal breaker, or can I use ground? This looks delicious! Looking to make this for about 40 people for 60th birthday party. Have you tried baking the chicken (bone in) instead of deboning and cooking on the stove? Curious if anything will change. I can’t possibly fathom standing at the stove cooking enough for the masses. I CAN NOT wait to try this out this weekend! My husband loves to get chicken teriyaki from Sakura Japan. We are only able to enjoy this deliciousness is when we go to the mall which is not very often. He is going to love this when I show him this recipe. We have been looking for this recipe forever. I am so glad I stumbled upon your page! This is great. Thank you so much for sharing this!!!!! Super excited! I just finished dinner. Having tried multiple teriyaki recipes, this is ABSOLUTELY the best one, hands down. After marinating the meat (I didn’t use a mixer or a meat slicer), I grilled in a skillet as hot as my gas pro-cooktop could get for 5-6 mins each side. I used store-bought chicken stock and powdered ginger & garlic. I had the fresh ones on hand but forgot to chop them until the last minute so I cheated. I added 2 tsp additional corn starch with 1/4 water in the sauce. Could add a dash of red pepper to the sauce…Mmmm. So good!!! For the teriyaki sauce says 1/5 cup for water and soy sauce. Is that a typo or is it correct? 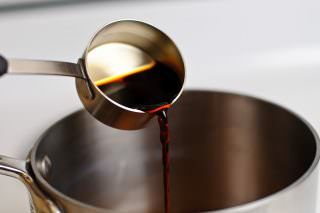 If it’s correct what’s the best way to measure out 1/5 cup? Is this recipe a copycat chicken teriyaki of Sarku Japan? 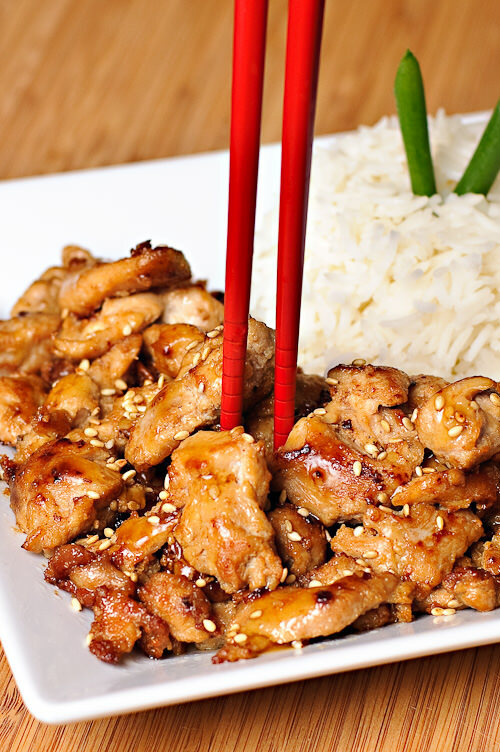 Best chicken teriyaki recipe. Although is a lot’s of work but, it’s worth it. Thanks for the recipe. It is definitely a keeper. 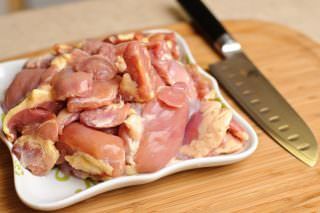 Could I substitute the chicken thighs with Turkey thighs? I have been making this for years now. It is my husbands favorite meal. Once you make it a few times it really is easy. My children all eat it without a single complaint which is amazing! Make this chicken and you will not be disappointed! Thank you for a very kind comment, Shannon. I agree, once you get the hang of it, it is quite easy to make. Thank you one more time!